Bridgestone Duravis R 410 is specially designed to meet the heavy daily needs of modern vans with the comfort of a passenger car. The jointless cap layer patterns from Bridgestone helps in achieving high speed capability and long tread life. The even tread wear is achieved through the C.S.C. tread-block technology. Also, the technically designed treads offer higher mileage than its principal competitors. 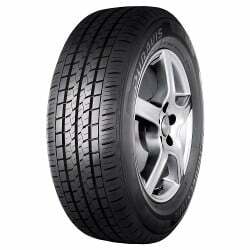 The comfortable travel experience as of a car is offered by the advanced and precise tyre technology. It may be a smooth driving on city streets or tough motoring on highways, Duravis R410 offers excellent driving experience with unequalled performance even on wet and slippery conditions. With reduced travel noise, the tyre also offers excellent cornering stability, outstanding response to the steering and greater resistance to aquaplaning.